The sun shines everywhere in Maryland. 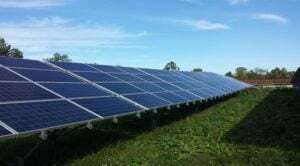 But too few Marylanders could take advantage of solar energy before the advent of a statewide community solar three-year pilot program of approximately 196 MW. Community, or shared, solar makes it possible for anyone with an electric bill to access solar energy, even if they can’t put it where they live. Shared solar means photovoltaic (PV) systems can be somewhere else in the community (in a field, on a building, over a parking lot, and elsewhere) but provide the benefits of solar electricity to participating subscribers. Community solar also represents a significant opportunity to expand direct access to Maryland’s renewable energy economy to everyone in the state. A successful pilot program that delivers energy savings to a wide variety of participants and builds a diverse portfolio of shared renewable projects will broaden and deepen the state’s constituency for renewable, clean, distributed energy. It will also make the case for a permanent and expanded program. Now that the program is officially launched across much of the state, Solar United Neighbors decided to take a closer look at community solar in Maryland to date. In our recently released report that is the first of its kind about the Maryland program, we cover its history and structure, highlight some projects happening across the state, and investigate some of the program’s successes and challenges so far. The report is meant to establish a baseline for future analysis of Maryland’s community solar program. We will be revisiting the program to track its progress in future reports, so that a future, permanent program can build on the pilot’s successes and learn from any mistakes made. Maryland’s recently launched pilot program is on the cusp of making solar accessible to almost everyone in the state. Over the next few years, we will learn much more about how successful the program will be in making renewable energy accessible to a diverse cross-section of Marylanders across the state. A permanent program, building on the pilot’s successes and learning from its mistakes, will need to grow beyond the pilot program’s size constraints currently restricting expansion. But if successful, the permanent program could play a central role in speeding Maryland toward a renewable energy economy that’s accessible to and benefits all residents.